One of the cool things about Source is the skybox feature. It’s something I’ve craved for years, and was finally delivered. The great thing about skyboxes is not only do they make things look cool and bigger than they really are, but in the process make the world seem more believable. Combined with sensible partitioning of accessible areas, and you can create a world that seems immense…. and real. I’m one of those people who, when I was young, playing games, wondered why I couldn’t get past certain boundaries. I always wanted to explore past that ‘invisible’ wall or jump through that window to see what else was there - even if it turned out to be cardboard cutouts of something exciting. A game that didn’t make me want to do that was disappointing, because in doing so it had failed to get me engaged in the world. It had made me aware of boundaries. A good game environment convinces you that there’s more to the game world than what you see around you. The key is really making sure that the boundaries are seamless. The playable area and the non-playable area seem as real and as solid as each other, the only difference being that one is accessible and the other isn’t. The real boundary is hidden back in the non-playable area, just out of sight of the player. The only reason they can’t see it is because something is in the way. Next you have to make sure that the bits behind the barrier are appropriate and realistic. Even though the player will never reach them, they need to fit in with the environment and not draw attention to themselves. They should be there simply because they’re there, not because there was a spare patch of land without a dozen brushes on it. That is, everything needs purpose and some logic behind them. Of course the huge benefit of areas the player can’t access is that you can break rules. You can have large open areas or exciting vistas that you could never let the player out onto. They help break up the horizon/skyline and can give the player subtle indications of direction. As always, the official CS:S maps do this really well. Nuke has an amazing amount of background detail, and it all fits in with the theme of the map - everything there has a purpose and helps create a strong sense of vastness. Compound is good at hiding the fact that you are locked into a specific area - if it weren’t for a couple of fences you could loop completely around the map. The fact that you really could do that if the fences weren’t there makes it even better; it’s an intentional annoyance rather than a blatant limitation of the game engine. 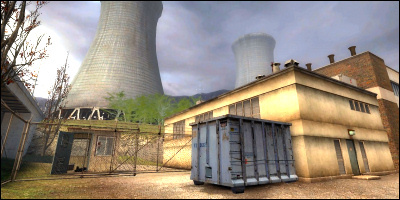 Even earlier versions of Office for Counter-Strike 1.6 used similar tactics to make the world seem unbounded. Common mistakes from maps I’ve seen is that the skybox is all too often too obvious, and fail to merge in nicely with the local environment. I’ve seen too many large mountains that peak in spikes, circling the entire map and creating an unconvincing bowl. Where’s the way in? Or out? And why is there nothing behind these dangerously sharp peaks? A good skybox does not draw attention to itself. As always, it’s simply a bit of observation and common sense.